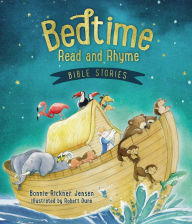 Unlike a typical bible storybook, the purpose of these stories is to entertain and reinforce bible truths through rhyme and repetition. I found the stories to hold the attention of young children. The catchy rhyme format is almost like a song- and sticks to the essential spiritual truths for each story. This book would make a good first introduction to popular bible stories for children unfamiliar with the bible. This is a good choice for a casual, lighthearted bedtime book. These simple stories could also be used as a springboard for a discussion of the bible account from the bible as well. I can imagine the lively discussions that could be started with older children contrasting the actual bible accounts with these stories. If you are looking for a fresh unique way to capture your child's interest- this makes a great choice. As a blogger for Booklook bloggers I received this book published by Tommy Nelson for the purpose of writing this review.